1958: "Wake Up, Susan - You'll Want To See This!" This Spring five Orca K-8 middle school students worked with local historian Mikala Woodward to gather evidence about the seven homes that were torn down in 1988, when the old Whitworth School building was replaced and the site expanded. The students examined historic photographs, documents, newspapers, and other primary sources. They used their imaginations to weave this evidence into stories. Now they would like to share them with you. The Whitworth Playfield at Orca K-8 is located at the intersection of 45th Avenue South and South Dawson Street, in South Seattle. To the staff and families at Orca K-8; to the nieghbors who contributed memories, expertise, and other assistance; to the archivists and librarians who helped us track down historical documents; and to the Mayor's Office of Arts & Cultural Affairs for supporting this project. Glen Russell woke up on Monday morning, September 9, 1960. He was ecstatic about his first day at his new job at Rainer Beach Junior Senior High School. The school had just been built, and this was the first day the students would be inside it. He was excited to see the children’s smiling faces. He grabbed a cup of joe on his way out the door and kissed his little kitty good bye. As he walked down the street, he saw an old lady with hair as white as snow that shimmered in the sky like millions of diamonds, yelling for help. Glen rushed over to see what had happened and noticed that her cat was tightly holding onto the top of the tree for dear life. Glen insisted on rescuing the cat. He climbed the tree, and just when the cat was finally within his reach, the cat jumped on him and made him lose his grip and fall. The cat jumped into the old lady’s arms and licked her face with enthusiasm. The old lady thanked Glen and helped him up. She noticed that it looked like he had injured his arm, and offered to give him a ride to the hospital. Glen thanked her and said he was already late for work. His day wasn’t turning out the way he wanted it. Glen walked down the street with a broken arm and low expectations that his day would turn out any better. He was approached by little girl who asked him if he could spare some money. Being the generous man he was, he gave the girl five dollars and wished her a wonderful day. Glen arrived at the bus stop, and was about to get on the bus we he realized he had no bus fare, because he had given the girl all his spare change. So he walked 3.4 miles to the school. He had a broken arm, no money, his legs hurt and he was also late. But he was still looking forward to doing his job. As he walked in the door, he heard his name on the speaker. 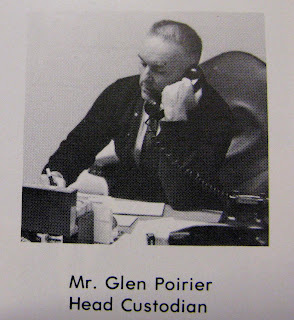 Mr. Glen Poirier, the head custodian, was calling Glen Russell into his office to talk to him about why he was 3 hours late. Glen explained to him about the lady with hair that was as white as snow and the little girl who needed money. Mr. Poirier straightened his red and blue Rainier Beach necktie, said he understood completely, and let Glen off the hook. Glen’s day had gone down hill rapidly, but he realized there was always tomorrow. Even though he didn’t have a good day he helped the people around him with their problems and this made him feel good. He caught the next bus to the hospital with a smile on his face. 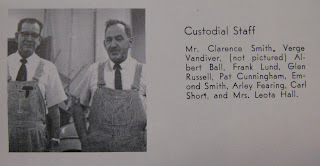 Linda Zbigley, who attended Rainier Beach High School in the 1960s, told us about the Head Custodian, Glen Poirier, who always wore a red and blue tie to work, because those were the school colors. Go Vikings! We found pictures of Glen Poirier in several of the Rainier Beach High School year books from the 1960s. We found Glen Russell’s name listed in the 1967 yearbook, but no picture of him. 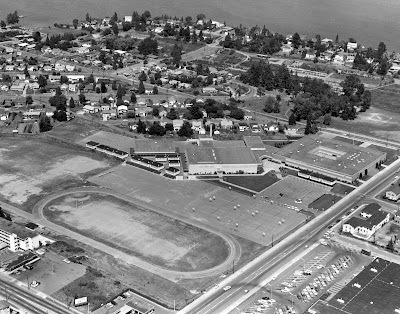 Rainier Beach Junior Senior High opened in 1960 to relieve overcrowding at Franklin High School. 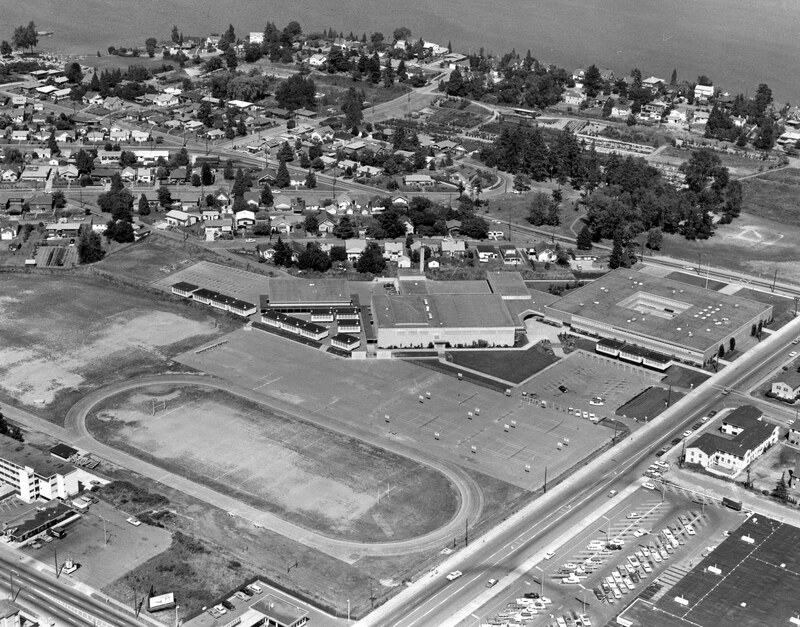 Source: Seattle Public School Archives.